A few nights ago, we left the kids with Grandpa and Grandma, and Pilgrim Dad and I took off for a nice long dinner date to celebrate our EIGHTH wedding anniversary. In an age where marriages and families are being assailed on all fronts, we are thankful to God for bringing us together, keeping us together, and moving us together. 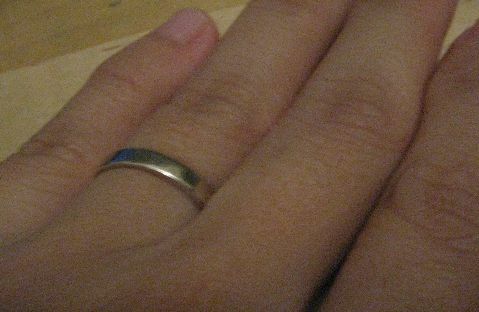 This is my wedding ring, sitting on my left hand where it has been for the past 8 years. I remember the first week it was there. It was an awkward uncomfortable feeling, having this hard metal object permanently on my hand where previously there was nothing. Though it was light, its unfamiliarity made it heavy. But I decided to keep it there. I’d made a promise before God, this ring was the symbol of that promise, so I would just keep wearing it. Athos: Mommy aren’t you going to swim? Pilgrim Mom: No I can’t. PM: [takes deep breath, decides to go with factual approach] I’m having my period. Athos: I know about periods. Athos: There’s the Cretaceous period, the Jurassic period and the Triassic period. Here’s a fun kitchen activity for the kids, especially when the menu for the day is salad! Anyone who’s been following this blog will know that the Pilgrims have an inexplicable attachment to the homemade volcano. We’ve done the regular, the upsize and the mini-explosive. As you can see, the kids were FAR more impressed with this one. Now that that’s out of the way I can get on with my life again…. School is out for the whole of next week! The kids are looking forward to lazy mornings and relaxed bedtime rules. It’ll be a busy week at work, but still, I’m thankful I managed to get some time off. We plan to go to Wild Wild Wet. The boys love that place and we haven’t been in a long while. For gentle readers residing in Singapore and scratching their heads over what to do with the kids, see if the Places to Go page gives you any inspiration. I would recommend the Science Centre in particular, because the iFuture exhibition going on there is fascinating, and ends 18 March. Porthos: Hello…. Do you want to come to our house? I have a lot of cars…. I have a lot of sports cars…. Come to our house. You can do whatever you want. Now what woman can resist such an offer!